The Provost and Fellows of King’s College, Cambridge are delighted to announce the appointment of Daniel Hyde as Director of Music at King’s, to take office on 1 October 2019. Mr Hyde will succeed Stephen Cleobury CBE, who has held the post with great distinction since 1982. Mr Hyde, who will also become a Fellow of King’s College, came up to the College in 2000 as Organ Scholar, subsequently graduating with a First in Music. 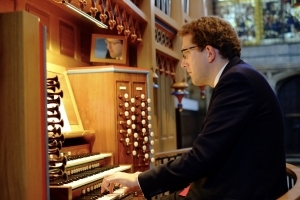 He has directed the Choirs of Jesus College, Cambridge and Magdalen College, Oxford, and is presently Organist and Director of Music at St Thomas Church, Fifth Avenue, New York. Besides his choral work he is a distinguished conductor and organist; his work has included directing the Britten Sinfonia, the Orchestra of the Age of Enlightenment, the Academy of St Martin in the Fields and the City of London Sinfonia. Remarkably, Mr Hyde will be only the sixth person to hold the post of Director of Music at King’s since the turn of the 20th Century, and only the ninth substantive appointment since 1799. He will be entrusted with a musical tradition admired around the world, thanks to the work of his eminent predecessors. More information about the Choir is available on the King’s College website.